DinoEye AM422X analog eyepiece camera for microscopes brings microscopy into a sharable and ergonomically pleasing experience. The AM422X has a unique small tubular design made to fit into most eyepiece slots. The scope itself is 23mm in diameter and comes with two adapters of 30mm and 30.5mm diameters which can freely slide up and down the eyepiece body and locked into position for the perfect focal distance. The analog interface is the ideal setup for those situations where you cannot use a computer and require direct real time imaging while examining your important specimens for extended periods in the lab or used as a production line camera. Using the analog camera can also enhance the teaching experience for teachers with live lag free visuals of specimens, or intrigue audiences in a presentation with real time visuals. Simply plug in the eyepiece to a composite video input on a television set or a projector, and then power the device to an electrical outlet and you are ready to use the eyepiece. Use the AM422X for long hours in the laboratory; production line; or share your specimens to an audience. 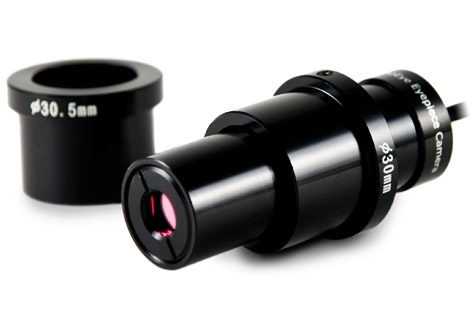 The DinoEye AM422X analog eyepiece would surely be the perfect companion for your microscopy needs.